Transforming teaching, learning and leadership through the strategic application of technology has been Miguel Guhlin’s motto. As a veteran educator comfortable with modeling the use of technology at the classroom, campus, and district level, he has a simple goal. That goal is to use powerful technologies to transform practice and enable learners to communicate and collaborate with each other. As Director of Professional Development for the TCEA.org in Texas, Past President of the state-wide Technology Education Coordinators (TCEA’s TEC-SIG) group in one of the largest United States technology educator organizations, as well recipient of the ISTE Making IT Happen Award, and Google Certified Trainer, Google Certified Innovator, Microsoft Certified Trainer and Expert, as well as Minecraft Education Edition Certified Trainer, he continues to model the use of emerging technologies in schools. He is available to speak as a keynote speaker and workshop facilitator on a variety of topics. Make contact via email at mguhlin@gmail.com or call 210-617-3330. How does Miguel make a living? 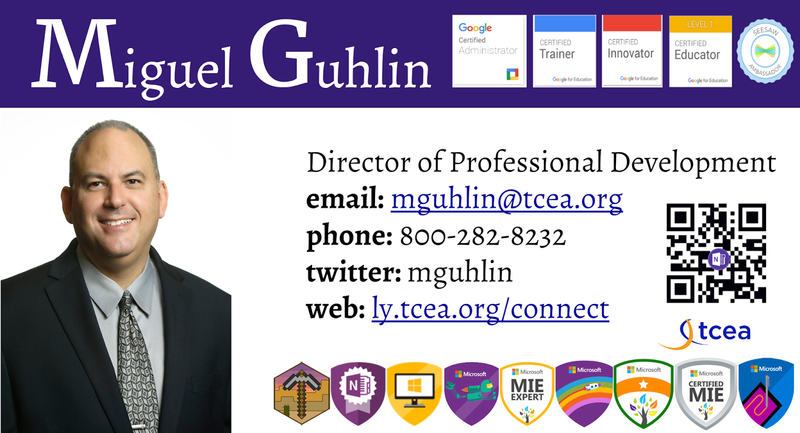 Well, Miguel is currently the Director of Professional Development for the TCEA.org (since 03/21/16). Before that, he served as Director of Technology for the East Central ISD (2.7 years), and Director of Instructional Technology for San Antonio ISD (9.7 years). Out of that question, Miguel began his writing career (as a published author…book reports in school don’t count, no matter how fun they were). Miguel has also written a monthly column for Education World, that venerable online magazine. Miguel owns the copyright on almost all his published articles, except those adapted by Technology and Learning for their print magazine, a few printed in past years (check my vitae) by a few select commercial magazines. Yes, I’m a blogger. I started my ‘’Around the Corner-MGuhlin.org blog sometime ago (over 7,000 entries that have since ended up offline due to an old blogging engine that couldn’t export content) and haven’t looked back too much, except for the obligatory navel-gazing that characterizes bloggers. I don’t get paid for blogging, although I am open to donations. What I write on my blog is strictly for fun, playing with ideas, as well as exploring the intersection of education, technology and spiritual beings. I have provided quite a few guest blog entries for other blogs, too numerous to list here. LeaderTalk.org: LeaderTalk is the first group blog written by school leaders for school leaders. We hope that our insights and resources are beneficial to P-12 administrators and educational leadership preparation programs. Not so much anymore. Business ties: Not sure I have any. I do work for a non-profit education organization, TCEA.org. But it’s non-profit and I don’t get paid to promote products or anything like that. If I get free stuff (uh no, can’t think of anything), it’s usually because I’m an “ambassador” for a program, such as Seesaw (it’s awesome, why aren’t you using it?). Media ties: Aside from what I’ve already shared, you know my media ties. They are pretty much non-existent. Religion: Since I occasionally write about spiritual matters, if only to highlight how much I fall short, I’ll confess that I’m a Catholic who doesn’t attend church as often as I should, but console myself listening to radio-evangelists. I believe that Jesus is THE Christ, that he who calls on His Name, regards him as Lord and Saviour shall dwell with Him in the House of the Lord forever and ever. I find that I identify with the Moses of Exodus 3:11, and with the sinner who beat his breast at his sinfulness. However, I do not believe in a Monster God who waits to devour us and cast us into a burning lake of fire, but rather, a God of love who helps us make chicken salad out of chicken…well, you know. No matter what. Why? Because He has faith in me. Politics: I’m not sure where I fall in. In recent years, I’ve found myself voting Democrat but condemning abortion. So, to keep it simple, I vote Democrat even as I abhor abortion. It is the single defining issue, and it’s darned unfair that we have to be black or white, Republican or Democrat in this day and age. Maybe, back in the old days when folks were less educated, such absolutes were needed, but now, we do our best. I agree with Bonhoeffer that the conscience of Man hasn’t got a clue, and can’t be trusted. The only way is to pray. There are a lot of issues, but I’m not going to jump into those now. If you have a question, drop me an email and maybe I’ll formulate an opinion. 1. Please list your other current employers, whether full time or part time. Everything posted on Miguel Guhlin’s blogs/wikis are his personal opinion and do not necessarily represent the views of his employer(s) or its clients. 2. For what other employers (consulting) have you worked in the last three years? 2016-2017: Nothing at this time. Too busy! 2015-2016: I currently serve as TCEA TEC-SIG Vice-President/President-Elect (yes, I reprise my previous role–what fun!). In the past, I have served as Vice-President and President of the TCEA Technology Education Coordinators Special Interest Group (TEC-SIG). I have also been Past President (2007–2008). A few years ago, I also served as the TCEA Area 20 Director—and as such, on the Board of Directors. My term expired and I did not seek re-election, although I reserve the right to go to Austin and hold those folks accountable. I haven’t done any work, paid or unpaid, in politics or government. I have written a few letters as an American citizen to complain about Net Neutrality, SOPA, the state of educational technology funding, etc. I have also advocated on behalf of technology applications, electronic resources funding, and a few other educational technology topics. None that I’m aware of, and if I did, I’d be sure to point them out. None, except to have travel paid to speaking engagements, and I shared my involvement on my blog. I pay for my own lunch when dining with vendors. For example, if I’m representing my school district, I do not accept anything at “no-cost” for myself, but only on behalf of my school district and only with my supervisor’s written approval. If I’m blogging/podcasting, and something is offered, I’ll be sure to note it in my blog entry to ensure transparency. No. If I make mistakes, I correct them on my blog. These questions adapted from Jeff Jarvis at BuzzMachine.com. Need to send me an encrypted communication? Use the PGP/GPG key below. Encrypt all your communications! It’s none of anyone else’s business, and you might protect yourself against incidental data loss/theft…it’s all about protecting your digital privacy. Use these tools to encrypt/decrypt your email. There are many tutorials available. Fourmilab’s web page (save it on your computer locally) on your own computer to encrypt text messages. Use secure passwords. Secure Space Encryptor (SSE) tool (lets you encrypt folders of files into one). Runs on Win/Mac/Linux. Watch this video.